It is no longer efficient to manually water your landscaping. With the water restrictions and increasing demand for water from population growth, it is important to conserve on your water consumption while maintaining your landscaping. Having an automatic sprinkler system installed is more cost and time efficient than using the old traditional watering methods. An automatic sprinkler systems can save up to 50% to conventional methods. At Affordable Sprinkler & Landscape, we will install your sprinkler system to help you maintain a healthy, radiant landscape that you can enjoy with your family and friends. Having a sprinkler system installed is the most convenient and efficient way to make sure your landscaping gets the proper amount of water. When an automatic sprinkler system is properly installed and maintained, it will help you conserve on water by not over watering. A sprinkler system is more than just sprinklers. The design and installation is a critical element that will affect your system’s performance and longevity. Poor design and installation can cost your more in the long run. 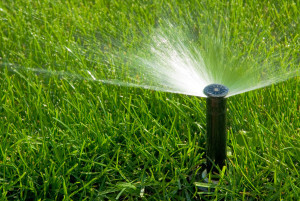 SAVE TIME: Having a sprinkler system will save you time by doing the watering for you. You no longer have to spend your mornings or afternoons moving the sprinklers around the yard to keep it looking radiant. SAVE MONEY: Using the timer on your sprinkler system will allow you to water your yard during the coolest part of the day for a set amount of time. No more getting distracted and forgetting to turn your sprinklers off. This will help you lower your water bill and help your plants live longer. With the addition of a rain sensor, you can program your sprinklers to skip their scheduled watering if it has recently rained. REST EASY: The Rain Bird name is your assurance of quality, value, and performance. Rain bird sprinkler systems are durable and can last the duration at your home. Each project we do is specially designed to fit your yards needs. The layout, climate, soil type and drainage of your yard will determine your landscaping needs. 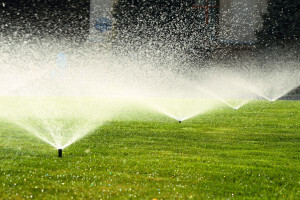 We will determine the correct placement for your sprinkler heads so that you receive optimum watering throughout your yard, at the correct times, with the proper amount of water. Meeting these three elements will help you maintain a healthy, radiant landscape. sprinkler system installed?You can have a sprinkler system installed anytime there is no snow on the ground and the ground is not frozen. Every year before the first freeze, it’s time to drain your sprinkler system to prevent damage to your system. Affordable Sprinkler & Landscape will take care of the winterization for you guaranteeing the job will be done right preventing any damage from taking place over the cold winters and preventing any expensive repairs. In the spring, we can start up your system back up and make sure everything is working correctly. We will check and make sure all the components are working properly and help to ensure that your system is ready to work for the season. At Affordable Sprinkler and Landscape we provide sprinkler installation estimates. To receive your free estimate, please call 303-940-1213 or fill out the form on the right. We provide services in the Denver metro area including most of Denver, Arvada, Golden, Lakewood, Morrison, Littleton, and Wheat Ridge.